A complete Air Quality Management Strategy (AQMS) system contains modules for Air Quality Assessment, Abatement Measure Assessment, Cost/benefit analyses and Optimum Abatement Strategy identification. Norwegian institute for Air Research, NILU, has developed professional management software for such work, AirQUIS. AirQUIS represents a main tool for establishing and integrating the different components of the AQMS. The system has been established and operated in more than 20 cities and urban areas world-wide. It received the European IT prize in 1998, and is being further developed and improved for a variety of applications. • Estimate environmental impacts from present and future developments. One of the main challenges in today’s society is to have timely and appropriate access to relevant and good quality environmental data. The aim is to enable actions whenever environmental requirements and limits are violated. 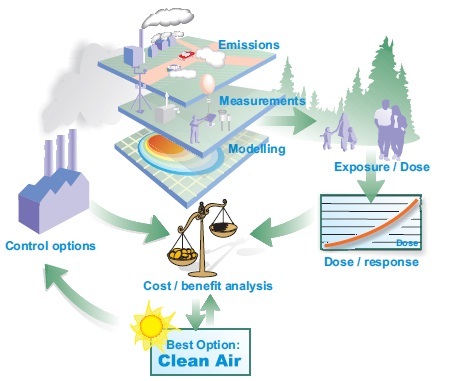 These were the challenges that a group of Dose / response Dose Exposure / Dose Modelling Emissions Mode Measurements Best Option: Control options Cost / benefit analysis scientists faced when a new generation of GIS based monitoring and planning system was to be developed in Norway. The AirQUIS technologies are now being used in environmental management to support integrated pollution prevention and control. It can aso be part of an emergency management system to support actions and crisis management during emergencies and accidents of various kinds. The environmental information system will have to combine the latest sensor and monitor technologies with data acquisition; data base developments, quality assurance, statistical and numerical models and advanced computer platforms for data processing, as well as distribution and dissemination of data and model results. • Statistical treatment and graphical presentation of measurements and modelling results. 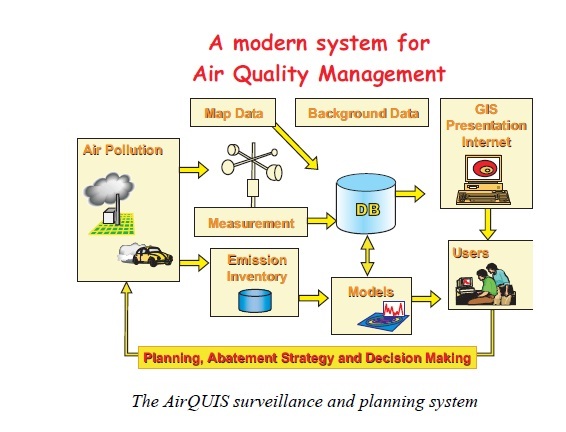 Based on a Geographical Information System (GIS) platform AirQUIS has been developed to handle air pollution problems. The main objective of a modern environmental surveillance platform of this kind is to enable direct data and information transfer and obtain a remote quality control of the data collection. The system combine monitoring, data presentation and modelling in one package, which enable the user not only to present and evaluate the present situation, but also to undertake environmental planning for a sustainable future. The GIS platform, on which the system is operated, provides easy access to the data and gives a perfect and easily understandable data presentation tool. Monetary valuation of control actions, and of the effects on health and the environment, may be different in concept and vary substantially from country to country. The cost-benefit analyses (CBA) are a highly interdisciplinary task. The CBA should provide a benefit-cost ratio based on monetarised costs and benefits, and be accompanied by a description of the non-monetarised items that also should be considered. NILU has conducted such CBA of possible measures for reducing the extent of pollution damage in several major urban areas in Asia. The World Bank project “URBAIR” was a forerunner for these analyses . All the various possible measures are cost estimated and put together in relation to calculated reductions in air pollution and the consequences for damage impact. Based on defined abatement options and scenarios, cost-benefit analyses can be used to evaluate the best possible options to reduce the air pollution load seen from an economic point of view. The results of such analyses may again lead to the development of action plans. An Air Quality Management and Planning System (AQMS) was established in the city of Guangzhou (6 mill. inhabitants) in South China . The core of the system was the GIS based AirQUIS system. The system is applied to develop action plans for air quality improvement in a cost-efficient manner. The project was a co-operation effort between involving several Norwegian institutes (with NILU as the leading institute) and research and municipal government institutions in Guangzhou. 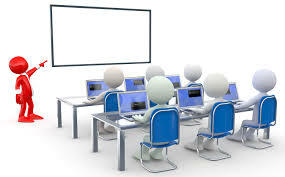 The nature of the project was "knowledge and tools transfer. The essence of the Action Plan dealt with air pollution exposure of the population rather than just emissions. In the action plan, the costs of each control option were calculated in terms of costs per percentage point of exposure reduction, and this is compared with the potential to reduce the pollution exposure that is associated with the option. Based upon this, the control options are ranked according to their cost-effectiveness. Least cost packages of control options to arrive at a given target for air quality can then be developed. This method is superior to the most used method of looking only at costs of emissions reduction and prioritising according to that, without taking into consideration the large effects that the emission conditions (location compared to the population centres, the stack height, etc.) have on the resulting pollution concentrations and exposure of the population. An integrated surveillance and planning tool is needed to select the right decisions in order to protect human health as well as materials and the ecosystem from an increasing impact of pollution. Heavily populated and industrialised areas experience a change in impact that is difficult to handle. Not only is the amount of pollution increasing in many areas, but also the composition and complexity is becoming more difficult to monitor, understand and solve. The GIS based surveillance and planning tool presented in this paper is one step towards obtaining the adequate and relevant information in order to select the right actions in the process of preventing too large damages. The GIS based on-line monitoring and warning system can predict the impact of selected scenarios for the future, and thus make it possible to implement the best available solutions. It is recommended that the monitoring, modelling and planning tools included cost/benefit analyses are used in order to get as much benefit out of the investments as possible. The AirQUIS system represents one of these GIS based platforms that enable direct quality assurance of the input data, which are essential for understanding the problems and in the next phase select the most cost effective solutions to avoid damages from environmental impacts.